H.265/HEVC is a cutting-edge, high-efficiency video codec that can compress video files to the half size with the same video quality as the original. That’s basic reason why it wins lots of users. If you have a large pile of DVD discs, why not rip DVD to H.265, which can save space while keeping the original quality. To achieve the goal, you will need a great and powerful DVD to H.265 converter. Here we highly recommend Brorsoft DVD Ripper. Serving as an outstanding DVD converter and ripper software designed with H.265 encoder, Brorsoft DVD ripper enables users to convert DVDs to H.265 MP4 with 50% output size reduced and original quality kept. What’s more, it has a built-in optimized profile bank which covers all the mainstream video formats MOV, MKV, FLV, M4V, WMV, MPG, 3GP, and popular devices iPad, iPhone, Galaxy Tab, Microsoft Surface RT/Pro and more. Thanks to the built-in video editor, you can personalize and retouch your videos in clicks. Download the program and learn how to rip and encode DVD to H.265 MP4 video. 1. Load source media > After installing this DVD to H.265 Converter software successfully, just run it. Then load in the source DVD you want to convert by inserting the DVD disc into the optical drive, dragging & dropping the ISO file or movie folder into the main region of the main interface. 2. Select H.265 as output format > Hit the “Format” box and select H.265 Video(*.mp4) from Common Video profile. It enables you to rip DVD to H.265 .mp4 with the best quality. Tip: Before conversion, this DVD ripping software allows you to click “Settings” button right besides “Format” and enter “Profile Settings” panel to adjust video size, bit rate, frame rate, sample rate and audio channels. 3. Start DVD to H.265 conversion > After all necessary settings, click “Convert” button to begin your DVD to H.265/HEVC conversion. Note that High codec H.265/HEVC will output much sharper video quality, but the conversion time will also relatively longer than common codec. 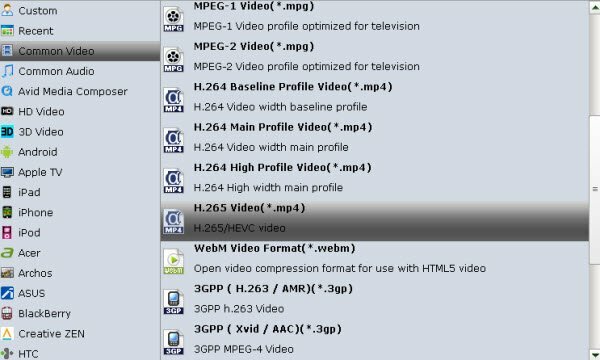 Once the conversion is done, click Open button to locate the results videos in H.265 codec. The final videos bring you the smaller size as possible with near zero quality loss. This entry was posted in video solution and tagged convert dvd to h.265 mp4, dvd to h.265, dvd to h.265 converter, dvd to h.265 encoder by admin. Bookmark the permalink.